I bought this 5 months ago and use it on a regular basis. With its slick and durable design, GPS and optional LTE, the Gear S3 Frontier has all the makings of the best smartwatch ever — if only it had more apps. Best smartwatch currently.its amoled screen combined with gorilla glass 3 and water dust resistance makes it a perfect buy for anyone. Probably the best smartwatch that is available out there. Worth it&apos;s money for a tech enthusiast. The only and the biggest con that I have is that in-spite of full hardware capability,it does not support samsung pay. Overall, the watch is very good, Totally recommended. Answering or rejecting calls using voice works very well. The screen looks really clear and bright. 6 Pricebaba users have written their experience with Samsung Gear S3 Frontier. 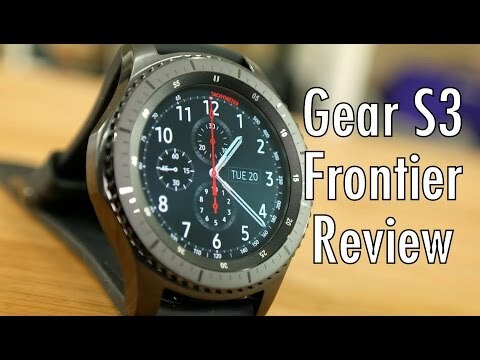 If you own Samsung Gear S3 Frontier, please do leave your feedback too. Samsung Gear S3 Frontier was launched in September 2016 with features like IP68 certification, resistance to dust, extreme temperatures and water, built-in mobile interface connectivity, and SOS mode for tracking locatio. Samsung Pay app can be used for making payment without using your wallet. Samsung Gear S3 Frontier comes with 1.3 inch AMOLED touch screen circular dial, Corning Gorilla SR+ glass screen protector, 360 x 360 pixels resolution and 278PPI pixel density. It has a dimension of 49 x 46 x 12.9 mm and its weight is 62 grams. It has a stainless steel Black coloured dial with 46mm size and removable Black coloured strap made of rubber. Samsung Gear S3 Frontier is equipped with Samsung Exynos 7270 dual-core processor, 768MB RAM, Tizen Operating System and 1GHz of speed. Accelerometer, gyroscope, barometer, ambient light sensor are in-built. Microphone and speaker are available. It has 2 buttons. The apps can be accessed easily just by rotating the steel bezel. Samsung Gear S3 Frontier comes with an internal storage of 4GB. Samsung Gear S3 Frontier is loaded with 380mAh battery with wireless charging facility. The charge can last up to 4 days. Users can enjoy connectivity through Wi-Fi, Bluetooth, NFC, GPS, 4G and 3G. It is compatible with Android. It has a voice calling facility. Samsung Gear S3 Frontier faces competition from Apple Watch Series 2. Samsung Gear S3 Frontier is larger and bulkier than Apple Watch Series 2. Users can use any 22mm strap with Samsung Gear S3 Frontier, whereas for Apple Watch Series 2, you have to use particular band. Samsung Gear S3 Frontier can resist water up to 5 feet underwater, whereas Apple Watch Series 2 can resist water up to 164 feet.